WASHINGTON - Dramatic U.S. government test results raise new concern that bulk shipments of rechargeable lithium batteries carried as cargo on passenger planes are susceptible to fires or explosions that could destroy the airliners. Yet U.S. and international officials have been slow to adopt safety restrictions that might affect the powerful industries that depend on the batteries and the airlines that profit from shipping them. The batteries are used in products ranging from cellphones and laptops to hybrid cars. Shipments of rechargeable batteries on passenger planes are supposed to be limited to no more than a handful in a single box, under safety standards set by the U.N.'s International Civil Aviation Organization and adopted by the U.S. and other nations. But a loophole permits shippers to pack many small boxes into one shipment and get around the rules. Tens of thousands of the batteries may be packed into pallets or containers and loaded into the cargo holds of wide-body passenger planes. 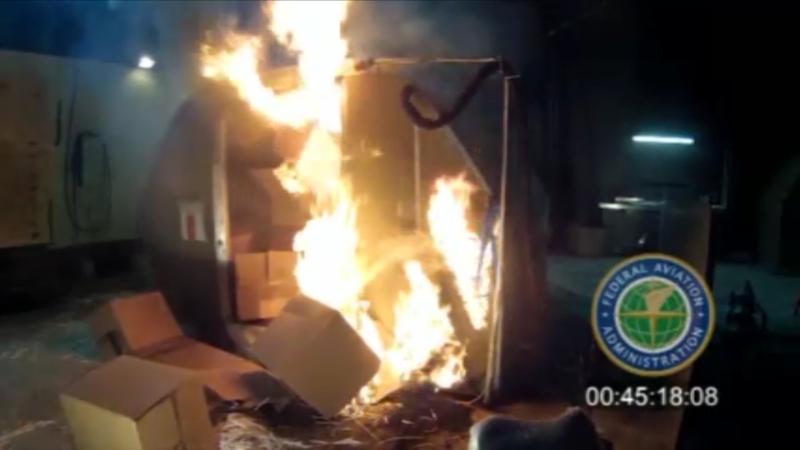 In an April test by the Federal Aviation Administration, a cargo container was packed with 5,000 lithium-ion batteries and a cartridge heater added to simulate a single battery experiencing uncontrolled overheating. The heat from the cartridge triggered escalating overheating in nearby batteries, which spread in a chain reaction. Temperatures reached about 1100 degrees Fahrenheit. Once about 300 batteries had become involved, a fierce explosion blew open the container door and sent boxes flying, catching FAA and industry observers by surprise. Within seconds, the cargo container was in flames. The explosion came from a buildup of flammable gases. A second test in September produced similar results, despite the addition of a fire suppression agent. Safety authorities have long known that lithium-ion batteries can fuel violent fires if they are defective, damaged, overcharged, incorrectly packaged or exposed to extreme heat. But they have been allowed to be shipped on passenger planes because it was thought the halon gas fire suppression systems in the cargo compartments of airliners could extinguish any fire. The container tests have raised a new worry: that an explosion could increase pressure in the cargo hold, activating depressurization valves that would let halon gas and smoke vent into the passenger cabin and cockpit. That would dilute fire suppression in the hold and let a fire rage unchecked. The cargo problem is distinct from the one that caused a fire two years ago in a lithium-ion battery installed as part of the operating system of a Boeing 787. In that case, Boeing failed to anticipate that a short circuit in one of the battery's eight cells could spread to the other cells and ignite a fire, the National Transportation Safety Board said Monday. The U.N.'s civil aviation agency is considering a series of proposals to strengthen packaging, labeling and handling standards for lithium-ion battery shipments, and airline pilot unions are pushing for limits on the number of batteries that can be transported. No consensus emerged at an October meeting in Brazil, and any changes aren't expected to take effect until 2017. By contrast, the U.N. agency decided earlier this year to ban shipments on passenger planes of lithium metal batteries, a non-rechargeable cousin to lithium-ion batteries typically used in toys, watches and medical devices. That ban goes into effect in January. About 10 percent of the 2.5 billion lithium metal batteries manufactured annually are shipped by air. Lithium-ion batteries are far more frequently shipped by air, but there has been no similar effort to ban their transport on passenger planes despite a heightened awareness of their dangers. About 4.8 billion lithium-ion cells were manufactured in 2013, and production is forecast to reach 8 billion a year by 2025. A battery contains two or more cells. The FAA tests show that transporting lithium-ion batteries carries "a similar fire risk" to that of lithium metal batteries, according to slide presentations by Paul Rohrbach, a systems engineer for aircraft maker Airbus. An airliner might be able to withstand a fire generated by a small number of lithium-ion batteries, but a fire involving lots of them could destroy the plane, he said. Rohrbach's presentation is an "industry position" reflecting the views of other aircraft manufacturers as well as Airbus, said Maryanne Greczyn, an Airbus spokeswoman. Lithium batteries dominate the global battery industry because they're cheap to make, lightweight and can hold a lot more energy than other types of batteries. U.S. regulators' hands are tied by a 2012 law that Congress enacted in response to industry lobbying. It prohibits the government from issuing regulations any more stringent than the U.N. agency's standards unless an international investigative agency can show the batteries ignited a fire that destroyed an aircraft. That's difficult, since in the three cases thus far in which batteries are suspected of causing fires that destroyed planes, the aircraft were too damaged to determine the source of the blaze. "I don't think we should wait for an accident before we take action," said Tom Haueter, a former National Transportation Safety Board air crash investigator. The industry says commerce would be hurt if countries have varying shipping standards. Instead, PRBA - The Rechargeable Battery Association urges stepped-up enforcement of existing standards. An inspection campaign by Canadian authorities found that 78 percent of companies that ship lithium batteries by air weren't declaring their shipments properly and "a surprising number of companies" had shipped damaged, defective and waste batteries, according to a slide presentation by one inspector. Such batteries are far more likely to catch fire.